Is your little one in the process of losing his or her baby teeth? Will they be approaching that time soon? Then it’s time to get crafty! 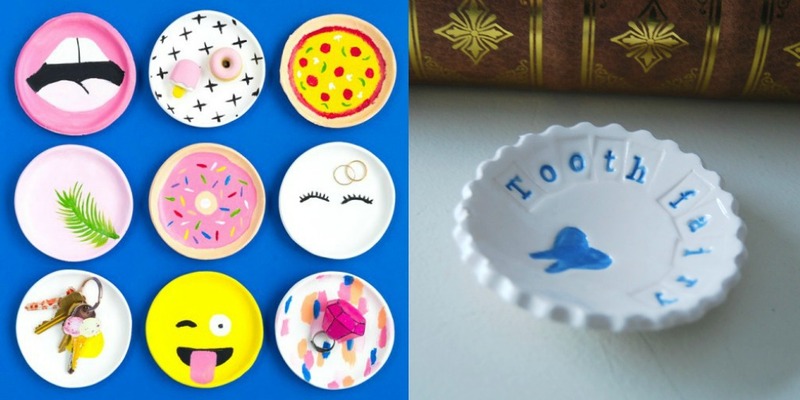 We’ve assembled 8+ DIY projects, from miniature Tooth Fairy doors to printable tooth receipts, perfectly suited for this magical day. This drawstring tooth pouch project is bright, fun, fast, and requires only light hand stitching and a few supplies (felt, yarn, and thread). Felt is available in a veritable rainbow of hues, so you can easily whip up a custom pouch in your little one’s favorite color. The finished pouches are soft and flexible, so they won’t cause any discomfort when placed beneath the pillow! The Tooth Fairy can’t complete her tooth/gift exchange if she doesn’t have a way to enter your room, and your “people sized door” isn’t dainty enough for a fancy gal like her! That’s why these miniature Tooth Fairy doors are just the right solution. 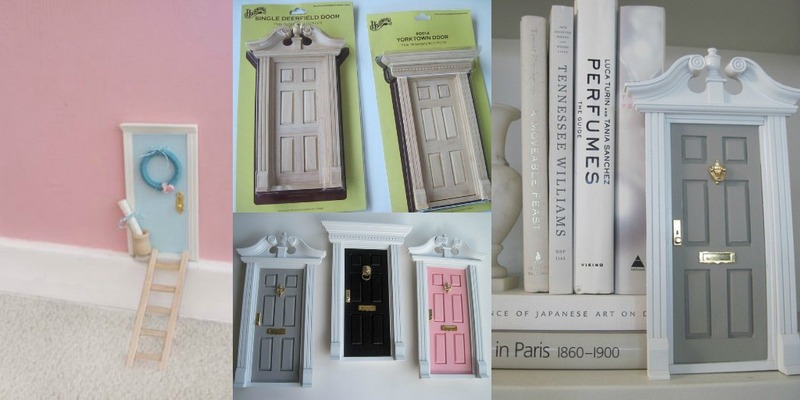 Craft stores carry small wooden doors intended for dollhouses, and once you pick up one of those, the rest of the project is simple: paint the door with acrylic paint, allow it to dry, and accessorize this itsy-bitsy entrance as you see fit. 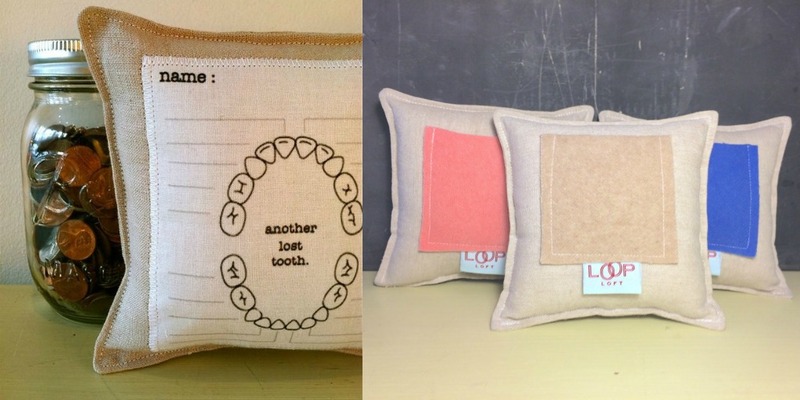 If your child is more analytical in nature, they’d probably enjoy a tooth pillow that has a diagram of their mouth on the outside. That way, they (with your help, of course) can record which date they lost which baby tooth, and have a detailed record of Tooth Fairy visits. The pillow pictured above is available for purchase through Etsy, but something similar could easily be constructed with a blank canvas pillow case and fabric paint markers. Some children demand proof that magical characters came to visit. For Santa Claus, it might be a note and a plate of half-eaten cookies. 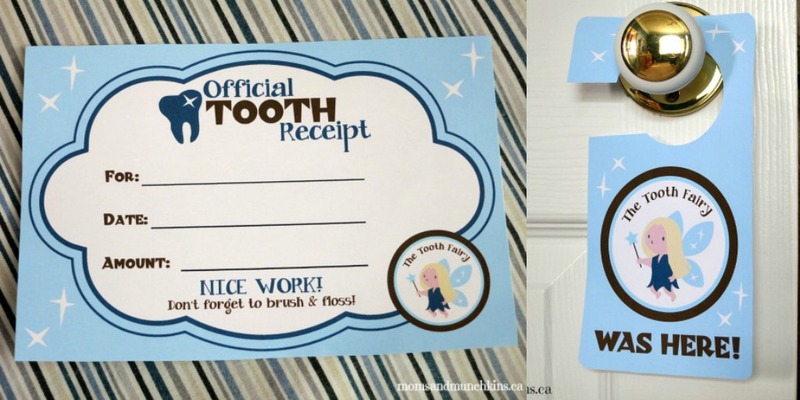 For the Tooth Fairy, how about a customized tooth receipt, and a sign for over the door handle? These playful printables will leave no doubt in your little one’s mind that The Tooth Fairy dropped by. Follow the link above for the free PDFs. 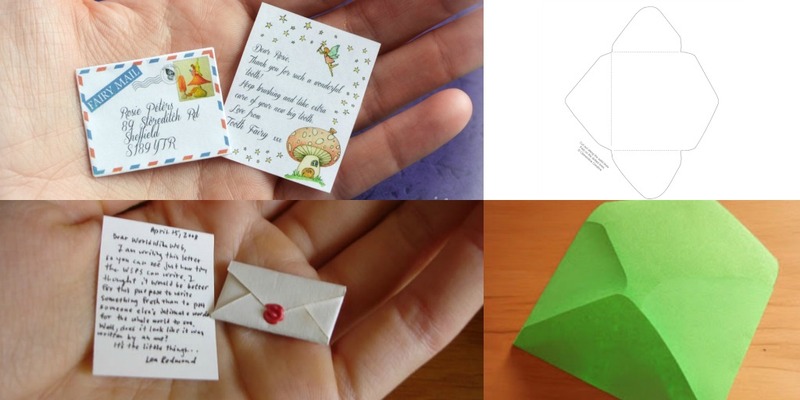 These teeny tiny notes are one of our favorite DIY ideas on this list – they’re just so irresistibly SMALL! The note/envelope set pictured above left is available for purchase, but if you’d rather put your tiny handwriting skills to the test, give a hand-made version a try. That way, you can fully customize the content. The link on the right-hand side above will lead you to free miniature envelope templates and liners. Wouldn’t it be fun to seal the letter with a small drip of wax? It’s all about attention to detail with the Tooth Fairy. Fluffy pillows have the tendency to swallow up little baby teeth while your children toss and turn throughout the evening, so a tooth trinket dish is a practical alternative to the classic pillow method. Both of the bowl styles above were constructed using air dry clay and craft paint. They can be decorated with whichever colors and simple images you like, but we, as you may have guessed, are partial to the mouth design! These wooden tooth dishes have a more rustic, traditional feel, if that’s an aesthetic you prefer. Plain wooden trinket bowls can be found at any craft store, along with paint and stickers for embellishments. 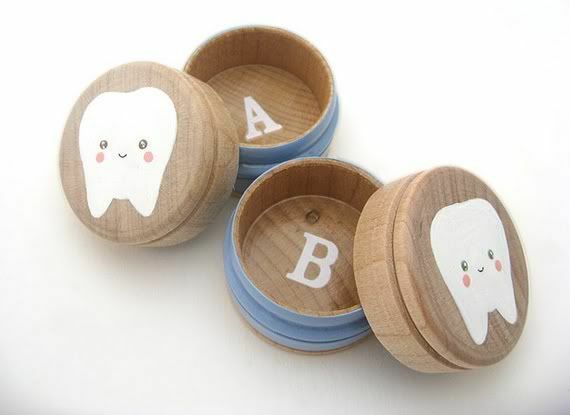 We also love the idea of lining the container with fabric, so the baby tooth has a cushioned resting place. Plus, fabric will help muffle the sound of the hard tooth rattling inside, allowing the Tooth Fairy to be more discreet with her nighttime comings and goings! 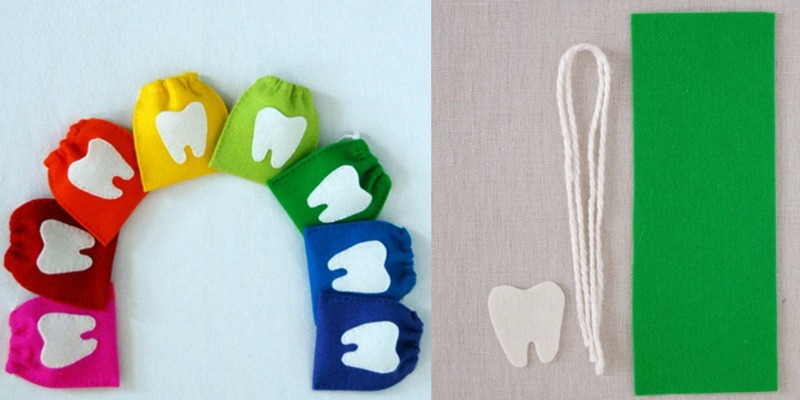 This might be the simplest, most classic tooth pouch of all. 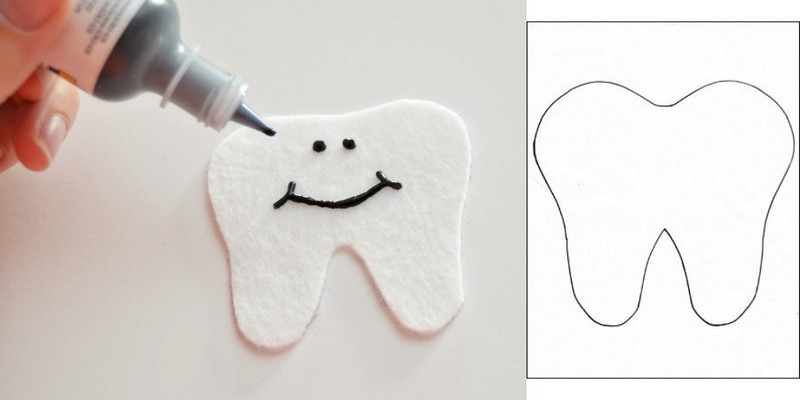 Simply use a pair of sharp scissors to cut out two matching teeth shapes out of white felt, and either use fabric glue or hand-stitching around the perimeter to create a pouch. Next, either leave the pouch plain, or add a quick smile with dimensional fabric paint. 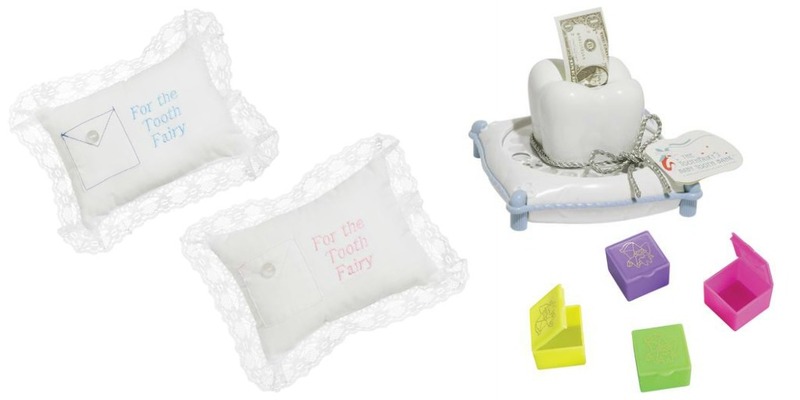 TOOTH FAIRY DAY PRODUCTS: NO DIY REQUIRED! 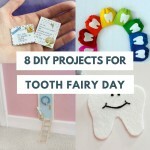 DIY projects aren’t for everyone, and just because crafting isn’t your scene doesn’t mean you don’t want to do something special to help commemorate Tooth Fairy Day. In that case, here are some Tooth Fairy-related products that are ready to use, straight from the package. 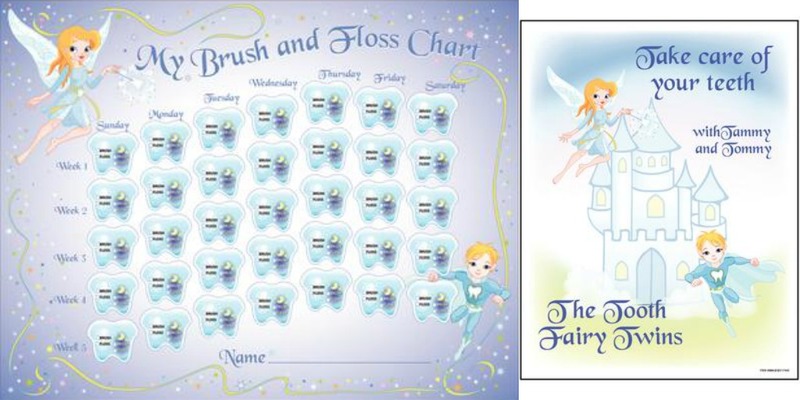 The chart is a fun and interactive way to get kids excited about oral hygiene progress. The coloring book will help them associate a fun activity (coloring!) with positive habits (brushing and flossing!). How about a dainty lace pillow, complete with a sewn-on envelope for your baby teeth? If that seems too delicate, we also carry more hardy plastic tooth boxes in assorted colors. 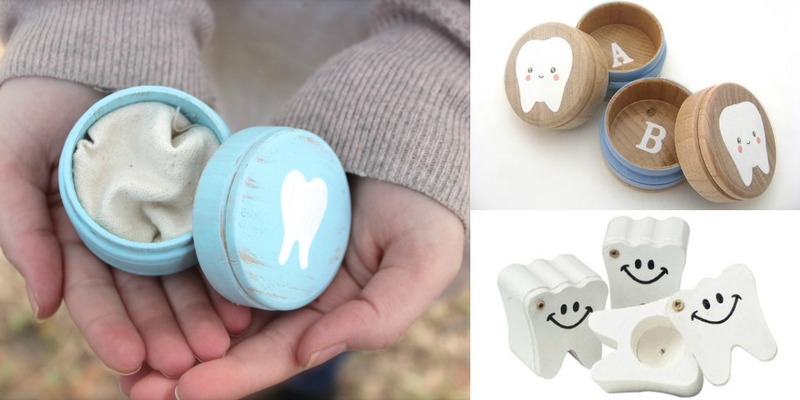 If it’s less about the tooth for you, and more about the money, then pick up a porcelain baby tooth bank! It’s a wonderful keepsake item that will store all of your “hard earned” tooth money in one safe spot. 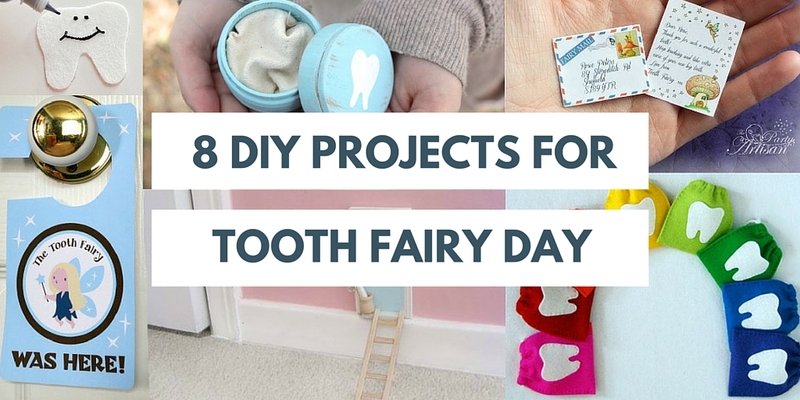 Might you try out any of these projects before Tooth Fairy Day on February 28? Do you have a favorite Tooth Fairy memory from childhood? Feel free to be social and share with us in the comments below! All your accessories are very unique and it may use as promoting your dental clinic. If you are used it for publicity then this may give positive result. Thanks for reading and commenting, Radhika. We definitely carry some fun toys and accessories that fit well to include in this post! Appreciate the feedback. Wow, what a great idea, it can help your little patients to get rid of the fear of dentists. Instead, they would love visiting their favourite doctor.